Spending the day in Disney World, or taking a mother daughter trip together, is a great way to bond with your daughter. There are so many great mother daughter activities that you can do even outside of the theme parks! I have put together a list of six of my favorite Disney World experiences for a perfect mother daughter vacation. In nearly every Disney theme park, you’ll find a unique Fireworks dining experience. These are more frequent during special events, but you can still find them in the Magic Kingdom. A fireworks dessert party will give you access to amazing seats for the show, and treats to munch on together while you wait! If you are looking for an experience filled with princesses, you may want to check out Cinderella’s Royal Table. Here you’ll dine like a princess, and get to meet nearly all of the Disney princesses! If you are going to eat here, I highly recommend booking a reservation WAY in advance. Seating is hard to come by, so you don’t want to wait. Check out our guide to the hardest Disney dining reservations. You’ll want to book early for those Disney hot spots! Disney Springs is an amazing place to go shopping! There are all kinds of popular stores, including places to buy great souvenirs. There are also excellent dining locations here for lunch or dinner, and performers at night. If you are looking to take a break from the parks for a while, I highly suggest giving Disney Springs a stop during your Disney stay! The Grand Floridian Resort has a Princess Tea Party available that you don’t want to miss! There is music, dancing, and even storytelling! Plus, there’s tea! You get to meet a few of the Disney princesses, and if your daughter is between 3-9 they will receive a gift keepsake! You don’t need to be a resort guest to attend this event, but you will need to book a reservation. Thinking of staying at a Disney resort? View our guide to the best ever Disney World resort stay! You’ll feel just like a princess on a horse-drawn carriage! Have you ever wanted to take a horse-drawn carriage? There are two resorts on Disney properties that offer carriage rides! Disney’s Port Orleans Resort Area and Disney’s Fort Wilderness Resort Area both offer carriage rides, and holiday sleigh rides are available during Christmas season. Each carriage ride is unique, and you don’t need to be a resort guest to take advantage of these. At the Grand Floridian Resort, you’ll find the Senses spa. This spa is a full-service spa and offers everything from massages to body treatments. A spa day can be a great way to relax and unwind together while you catch up. I highly recommend you make reservations if you plan on visiting this spa. This list only brushes the surface of Disney World experiences you can do together! 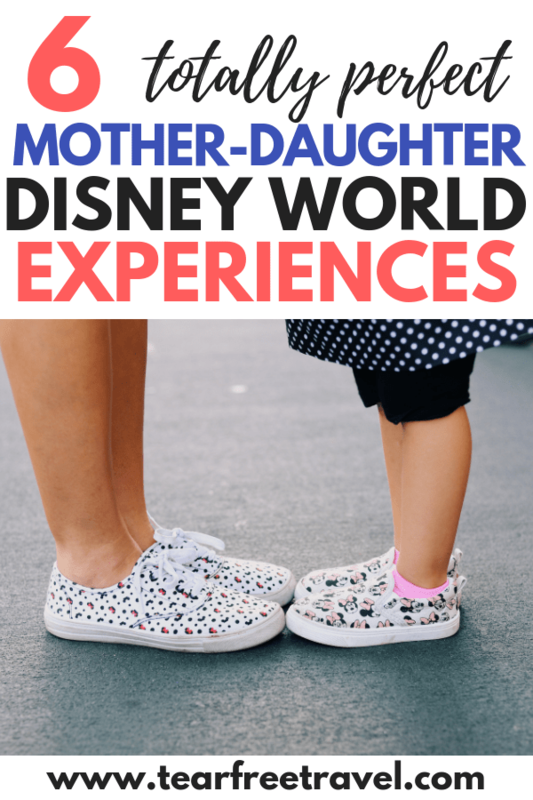 Whether you’re looking to spend more time together or go for Mother’s Day, I hope this list has inspired you to spend time with your mom or daughter at Disney World. Need help booking your trip to Disney? We ALWAYS recommend you use a travel agent for your Disney vacation. Disney certified vacation planners know LOADS of insider secrets to having the best Disney vacation and they don’t cost a cent! Get a quote now!